The only compact mini lift with an 83' reach! 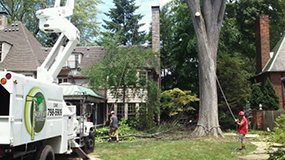 Tree removals require an experienced and skilled crew that can determine the safest and best way to take down the tree. Learn more. 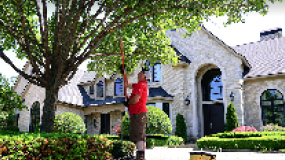 Tree pruning is the practice of cleaning up the tree of deadwood, breakage removal, raising the tree canopy and thinning out the limbs of the tree. Learn more. 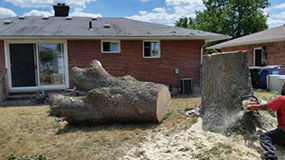 Tree Stump Grinding is a service we offer after a tree is removed from your property, or if you have an old stump that you are ready to get rid of. Learn more. We have a highly experienced crew dealing with hazardous and damaged trees and have the proper equipment to do what is needed. Learn more. Welcome to True Cut Tree Care. We are a professional tree service company located in Farmington, MI, serving cities throughout Metro Detroit. We are a licensed company well experienced, skilled and certified in tree removals and all types of tree care. We pride ourselves in being a small, family run business that has grown to be one of the most reputable companies in Southeast Michigan. 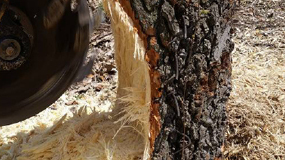 Some of our services include Tree Removal, Tree Trimming and Pruning, Stump Grinding, Tree Planting, Landscaping, Storm Damage, and Emergency Tree Service. Frank, Shawn and the crew did an outstanding job. I was impressed by their expertise. Their equipment was impressive and they did a great clean-up. A professional/courtesy crew that works well together. They focus on making sure their customer is satisfied with the job. I would definitely use True Cut Tree Care again and would highly recommend their service to others. True Cut Tree Service gets it right. Had a huge tree that needed to be removed. I called and the owner picked up the call and told me he would be over asap. He was at my home giving me an estimate in less than 2 hours. Got 3 different tree service company estimates and he was the cheapest. Work began the next day. I was impressed how professional he and his workers were and would recommend them to anyone that needs work done. Efficient and professional. I'm a business owner myself so I appreciate certain things. When a few large limbs fell in my back yard, and one overhanging the back deck, I called these gentleman for a quote. What I appreciated was a prompt callback, a fair price, and it was obvious that Frank and Alex enjoy what they do. When you enjoy what you do it shows, and it did with them. No problems, very thorough cleanup, and a handshake. That's how business is done. Thank you very much for a good job guys. True Cut Tree Service Staff were Prompt, Knowledgeable, Courteous, and Hard Working. These men removed two large trees . One in the backyard and one in my front yard. I will recommend them with a smile. They did a awesome job. Thanks again True Cut Tree Service, Shawn, Frank and the crew.